The way that U.S. oligarchs like Billary Clinton and their kin (like Hillary's brother Anthony Rodham) conduct their personal business in Haiti, you would think this was the 18th century and they are the rich creoles1 and autocrats of Napoleonic France. On Sunday, Hillary Clinton announced her candidacy for the presidency of the United States. What a rush for white feminist who have been salivating about this since the Monica Lewinsky intern scandal. Admittedly, if one took a time machine back to that period, when Republican right-wingers were in attack mode over the "Arkansa bubba" ascending to the world's highest office, it would be accurate to say that most so-called liberal women and blacks were on Hillary's team. However, this is 2015 and there has been a lot of water under the proverbial bridge since then. At her new campaign office in Brooklyn Haitians threw her a house-warming party of sorts: they protested her actions and failures, along with that of her husband Bill Clinton in Haiti, carrying signs that read "Where is the money?" The poverty pimpin' disaster profiteering crime syndicate operating in Haiti after the devastating earthquake want us to trust them with the disbursement of donor funds, however we have observed that when the Interim Haiti Recovery Commission (IHRC) headed by Bill Clinton voted to grant money to the Clinton Foundation and Bill Clinton recused himself, Susan Rice voted his proxy on behalf of USAID. So excuse us if we don't see it as a game-changer that on Sunday Hillary Clinton resigned from the board of the Clinton Foundation "to focus on her just-launched presidential campaign." Seems like everyone is questioning the Clinton's handling of funds, whether it is the Haiti donor funds or the millions their foundation accepted from foreign governments. These hot-button questions just won't go away and will dog this "inevitable" democratic candidate. The Clinton's are as toxic a choice for the democrats as they were in 2008. Makes one think that the democrats are not in it to win it. The discussion may just be academic though because, the last time voters elected a Democrat to the White House after a president from the same party had just served a full term? The last time was 159 years ago in 1856, before the Civil War. 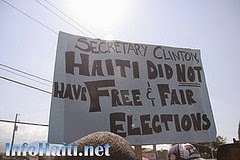 Clinton Foundation's chickens coming home to roost in Haiti? Clinton Foundation’s Deep Financial Ties to Ukrainian Oligarch Who Pushed for Closer Ties to EU Revealed. The Clinton Foundation controversy deepens. It doesn't bode well for Hillary Clinton's successful candidacy that Salon (a "left" website) ran a story before the anticipated announcement basically calling her a loser: "Hillary Clinton just doesn't get it: She's already running a losing campaign." How ironic is it that the US ("the land of the free") has taken the place of 18th century autocratic France in the virtual enslavement, harsh repression of democratic movements and the export of the rich resources of Haiti? The hidden war on Haiti has been outsourced to the UN military armies and police of 60+ countries (including the "war" prone and impoverished countries of: Afghanistan, Yemen, Turkey, Nepal, Sri Lanka, Mexico, Tunisia, Indonesia, Nigeria and Mali) and a patchwork of NGO administrators under the umbrella of The United States Agency for International Development (USAID). 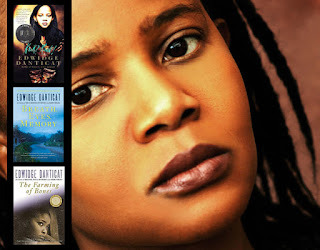 Haiti is now a fiscal paradise for the United States' richest families - wealthy as a Creole? No, wealthy as a Poverty Pimp. 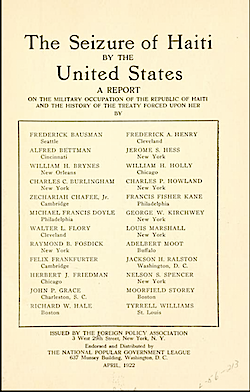 In the 11 year illegal occupation of Haiti by the US and keep in mind that Haiti does not qualify for Chapter 7 of the UN Charter. UN Cholera has killed over 10,000 Haitians (the official count is underestimated) and sickened 850,000 more, yet there has been a cover-up and no accountability. 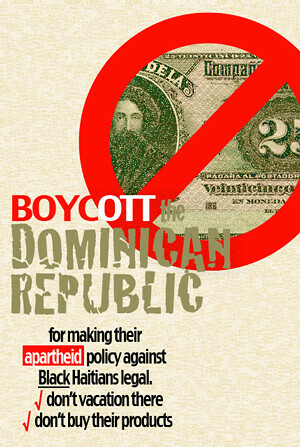 A U.S. sanctioned Dictatorship commenced as of January 12 this year. Haitians protested this peacefully in the streets and struggle to survive with rates of unemployment at 60% or more, as food and oil prices skyrocket. 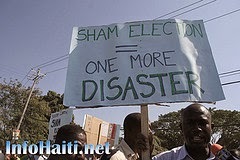 Protest were daily and picking up steam when a suspect Carnival tragedy that left some 17 Haitians dead. Symbols that had decidedly Western associations (skull & bones or pirate jolly rogers suggests US political honchos, not a Martelly regime sacrifice or curse to keep him in office as a despot/dictator like his hero Papa Doc Duvalier) were prominent at the point (the PaP cemetery) where the electrocution occurred. How is it that the vulture capitalist brother of Hillary Clinton, Tony Rodham got gold mining permits at the lowest royalty rate in the Western Hemisphere, while the masses starve on less than a dollar-a-day - not knowing where their next meal is coming? How unconscionable is that? Where are the donor monies that were supposed to build Haiti back better? Symbolically, the country's capital building is still in ruins. The new Republican Congress must investigate former U.S. Secretary of State Hillary Clinton's suspect dealings in Haiti and the extremely shady way The Hillary, Bill & Chelsea Clinton Foundation has operated in Haiti. The U.S. Congress must take up the question of AID distribution and make changes to the TIED aid system, which retards, rather than promotes development. 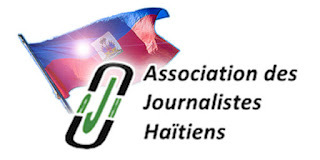 Haitians want their country to be self-sustaining, but the NGO system, which acts more as a slush fund, does not build self-sustaining institutions in Haiti or anywhere else they operate. 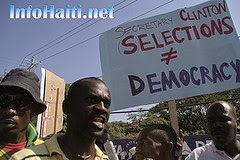 It should be a "no brainer" that given the unprecedented rate of impoverishment, unemployment, illiteracy, and the unjust way that outside intervention has destroyed development in Haiti that a "Marshall Plan" to restore real democracy, sovereignty and sustainability by establishing a "Haiti Permanent Fund" similar to the "Alaska Permanent Fund" be set-up that provides for a certain share of gold, oil, natural gas, iridium, copper and other revenues to benefit Haitians and future generations of Haitians. To be “as rich as a Creole” was a familiar boast in Paris, and a substantial portion of the French economy depended on this one distant settlement. This was the jewel of the French empire, furnishing the coffee drunk in Paris, the sugar needed to sweeten it, and the cotton and indigo worn by men and women of fashion. Saint Domingue’s commerce added up to more than a third of France’s foreign trade. One person in eight in France earned a living that stemmed from it. By 1776, this tiny colony produced more income than the entire Spanish empire in the Americas."